The Courtyard is a popular choice due to the 101 rooms available including the double queen rooms. These rooms are spacious and include free Wifi access and if you need to get work done on the road, desks with ergonomic chairs are in the room for your convenience. Complete with 32″ flat panel HD TV’s, Serta beds and luxury bed linens your stay is sure to be comfortable. 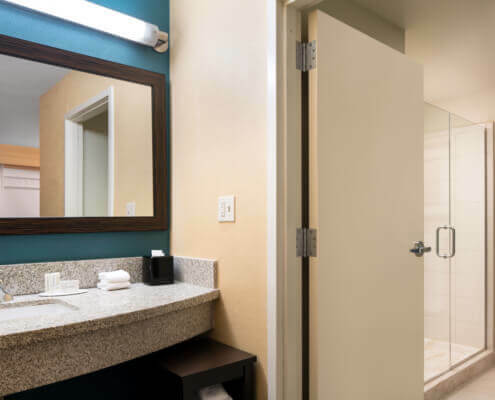 The amenities are endless, see what is included in each room. The Bistro in the lobby serves breakfast including Starbucks from 6 am – 10 am and dinner from 5pm-10pm. The indoor pool, the Jacuzzi and outdoor patio area are another reason visitors enjoy staying at the Courtyard. Traveling on a budget? Specials are frequently available. The Courtyard Glenwood Springs offers a meeting room with 600 square feet perfect for small group gatherings. The Doc Holliday room at the Courtyard can accommodate meetings for up to 30 people. Various setup styles are available with a flat screen TV and a projection screen that drops down from the ceiling for. Catering menus are available for breakfast, lunch, and dinner and they have something to offer every meeting.